I’ve got fed up of dodgy and unreliable streams and my girlfriend wasn’t using her NowTV box, so I decided to take the plunge and use their Sports Pass for today, using my bank details on her account. I think I’d gladly pay for day, week or month passes on this next year to get a good quality and reliable (and legal) means of watching F1. It’s working out well so far, especially having all the support races and features available on SSF1 too. Looking forwards to avoiding race result and watching highlights on C4 tonight. A combination of Ryder cup and no Martin Brundle along with a poor race in prospect makes it an easy decision. Being a Sky sunscriber for the football it will be a pleasant change for me. He replied on Twitter yesterday that he will be back for Austin. Commercial sponsorship enabled Frank Williams to enter F1 and build his multi-title-winning team, enabled Eddie Jordan to covert his junior league outfit into grand prix winners, Peter Sauber to switch from sports cars to F1, and Jackie Stewart to start a team from scratch. It enabled them to largely employ the best available drivers – without resorting to pay pedallers – off the back of global TV viewerships. So, Messrs Maffei and Carey, here’s the deal: Cancel all pay-TV contracts and chase eyeballs, whether via TV footprint or digital media. Offer free race broadcasts across the globe, with value-added services being the end-game. Sure, broadcast income initially will reduce, but managed correctly teams/corporate sponsorship will increase in proportion to offset any losses. Eventually. I think that's all a bit naive. The sums involved in F1 are far beyond what they used to be. Also, sponsorship has changed a lot. I doubt that there are many deals of significant value to be had out there. There's a limit to what exposure you can get if, as a sponsor, you choose to align yourself to an F1 team. Bernie knew that and offered sponsors a better deal with him. Times have changed a lot since the days of Frank Williams, Eddie Jordan and Peter Sauber. But I still think its harder for teams to find sponsors when the product is hidden behind a paywall. Why would a company today do a huge Vodafone size team title sponsorship knowing F1 is not FTA in most countries? Look at Williams loosing Martini will they get replaced? And McLaren has never been able to replace Vodafone never mind all the other sponsors that have left them. So, the question is: has sponsorship disappeared because F1 costs are too high, or because it's scarcely shown on free TV? Answer: both. I'm sure that the deals with the subscription broadcasters are very lucrative in the short to medium term. But who wants so pay millions for their logo on the side of a car that very few people can see? F1 costs are very high, the financial climate is still recovering from the 2008 crash...but there is still sponsorship money out there....and it's not going to F1 any more because few people can actually watch it. And with the quality of the product getting no better, how many people will be paying to watch it in 10 years time? It comes down to the product, Premiership Football is behind a paywall yet all teams are well sponsored and have very lucrative deals with companies because they are involved in a sport that is entertaining and mostly unpredictable. Current F1 is dreadful and has been for years, unless your a die hard fan you would never watch F1. Why anyone would want to own a team unless you are a billionaire with a son who isn't good enough to be in the sport otherwise is baffling. F1 teams would hand over an arm and a leg for those numbers! That's the point, though. If you have £75m to spend, would you spend it on an F1 team or Manchester United? Which do you think would be the most beneficial? In the past, F1 might have been able to attract big sponsors, but I would say that times have changed. Many other high-profile sports have gotten bigger and many sports that were not high-profile in the past, now are. There's a lot more places for big sponsors to put their money and I think F1 has dropped right down the list. I've said this before but Premiership football as it is today has always been based around a balance of pay TV live games and FTA highlights. F1 was always based on free live coverage in most countries with a pay TV upgrade for those who wanted it. Now that's been turned on it's head and that's what is driving sponsors away. 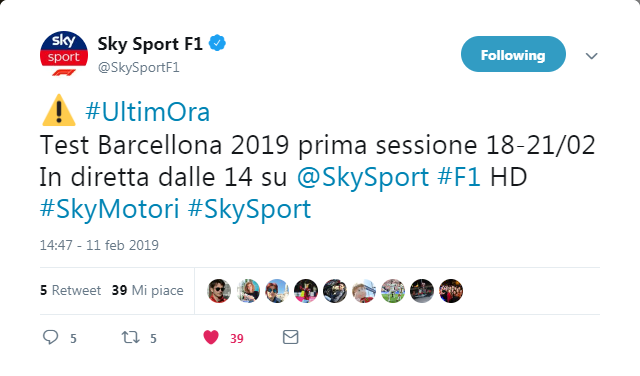 Sky Sport F1 Italy to broadcast the first four days of Barcelona's winter testing, I guess that Sky UK will do the same. Sky UK only broadcasting the afternoon. Yeah same for Sky Italy, from 2:00pm to 6:00pm. It makes sense. The mornings are dull usually so better to have a summary of that and go live in the afternoon. Nobody on the planet wants to actually watch eight solid hours of testing per day in any case. Still no word on whether Channel 4 will send their own team to races or just broadcast highlights of the Sky coverage? I would disagree. In any given test day, the fastest times are usually set before lunch. This is more apparent during the second test with bonafide quali sims followed by race sims, but the trend is pretty much set from Test 1, Day 1. Besides, because the clock resets each day, it's always reasonably intriguing to watch the lap-times tumble as the mornings progress, even if they aren't threatening the aggregated timesheets. I suppose you could make an equivalency with free practice. The first half is reserved to establish a competitive order, and the second half for longer runs and development work. Edited by TomNokoe, 11 February 2019 - 17:27. The EPL gets prime time coverage on the UK's biggest channel BBC1. Also there is many more games a year aired than F1 GP Races. 3-4 games a weekend vs one race every 2-4 weeks. Also look at how the advertising is in terms of coverage, animated advertising boards only showing one sponsor at a time, very effective at giving coverage to that sponsor no matter where the camera is, and only 2 teams, so the coverage of each team's sponsor will be high as well. VS F1 where 10 or so teams fighting for coverage of sponsors on their cars, and the track side sponsors relying on old obsolete fixed signs. Which require special camera movement to give them coverage. Revenue at Formula One has raced to a total of $16.2 billion over the past 15 years outstripping its closest rival the FIFA World Cup of soccer according to new research. Thats a fraction of what the TV deals are worth for the EPL. I feel F1 needs to push for FTA again, which seems to be happening everywhere except the UK, and then charge for value added extras such as live timing, archive footage etc. Sponsoring track side should be EPL style, and car sponsors showed on screen whilst we watching that car's onboard. This should also reduce reliance on horrible track side camera's so we get more onboard footage. Edited by chrcol, 11 February 2019 - 17:46. Whilst the fastest lap times are indeed around lunchtime, this is more than negated by the tedious morning installation laps (granted these are less frequent as testing goes on). The long runs are the interesting thing during testing imo. But appreciate not everyone feels the same on that count! Would be cool if we got some footage of the fastest laps of the morning before settling down for the live long runs. Will never happen, it will just be that Scots Sky Sports lad interviewing driver after driver instead. Testing coverage will be boring IMO so you get to see the cars on track for the first time teams only ever do test runs try stuff out etc does not warrant full coverage IMO. If it is raining no cars on track boring. Testing coverage does not appeal to me at all. Yes, it's boring. They should just ban it. They could replace this with another GP. Edited by pdac, 11 February 2019 - 23:34. Again Dorna beat them to it 15 years ago. You had what was called GP Zero. Last big IRTA test, three days, last day televised for about 3 hours with last hour a shootout for a BMW or something. Not sure if posted before but yes they are sending their own team to the races, so far it is Steve Jones, Coulthard, Webber, Jordan and Edwards and Lee McKenzie as before, the only ones that have left are Chandok and Suzie Wollf, they have also taken on Billy Monger which will interesting, so a strong team. I've been using Now TV to watch F1 for a few years now. I do so via the app on my PS4. I used it for the races Channel 4 didn't have live so the 24 hour package was the one I usually went for. That will have to change this season however. I need to calculate what the most cost effective method is. I'm sure someone has already done so. The coverage itself is good and the quality is full HD. I've had minimal issues with buffering. The only downside is it's delayed by a few seconds which can be annoying if, like me, you enjoy discussing the race online whilst it's happening. Otherwise it's a non issue. I’m holding out for a 9month £150 package like last season, the only problem this year sky knows people are painted into a corner... SoI’m not sure such a deal is going to come about. Now TV isn't even 1080p, which is ridiculous. If they upgraded to 1080p I would be tempted with another March-November offer. Edited by F1 Mike, 17 February 2019 - 23:42. Well, testing coverage is a bit naff. Sure it was good at first but the novelty soon wore off. Sky's daily round up and Ted's Notebook/Ask Crofty was better. I feel like this is the best of best of both worlds. No doubt we will see & hear from Ted soon enough. Not everyone is a fan of live testing coverage but some people will enjoy it. On TV it is dire. Any broadcaster would struggle to make it worthwhile. I kind of enjoyed it. Chandhok is great. If I had one criticism it would be that there was a bit too much general chit-chat about the state of play and not enough about what was actually happening on track. But I enjoyed it nontheless. Oh I enjoyed listening to Karun, agreed. He is always interesting. The actual watching was a bit meh. Difficult to get a sense of the cars as there were no constant comparisons as you would get trackside. To each their own, but I don't really get the appeal. If they went back to the days of each team running two cars at testing, it'd be a bit more watchable, but still dull. Friday practice is boring, but pre-season testing is on a whole different level of dull as far as a TV spectacle goes. What exactly is there to say about what is happening on track? We've suffered the ignominy of Buxton and Jacques, now we have Clarkson. What's with this extended vowel obsession, it's driving me bonkers. Now we've got Pinkham with the rising inflection. Edited by milestone 11, 20 February 2019 - 13:45. Some times, details of the running, etc - even outside of any context these are useful and interesting. Yesterday it took them ages to even mention that Magnussen was in the Haas, rather than Fittipaldi. Warning: Herbert is in the booth. One reporter strolling the pits and no commentators would be best coverage of testing. Why can I not hear the cars at all? All the better to hear Herberts pearls of wisdom I suppose. I honestly think some of you just love to moan about shite commentators. I've been enjoying the rotation of opinions, and just no, I can't think of anything worse than tv coverage of testing without commentary. Ted should either be down in the Pitlane or up in the comms box. Where is the fella?! They can sent bloody Herbert out there but not Ted?! Baffling. Quite enjoy watching him inspecting every surface of each car. Plus he’s a pro at hearing all the gossip too. You not think that since he's such a grafter all year that maybe he deserves some family time? He deserves nothing, GET HIM BACK NOW!!1! Nothing on Sky's EPG about next weeks testing. Are they not showing anything at all or do I have the dates wrong? Testing is from Tuesday next week onwards you're right there's absolutely nothing not even a daily roundup. I'd be surprised if that doesn't change its probably a scheduling oversight in the tv guide. I don't expect it to be live on sky again, I'd guess it will be exclusive to the F1 website. But that's just a guess. Edited by F1 Mike, 21 February 2019 - 12:53. F1 TV don't appear to be doing it either. Looks like they're checking numbers to see if it's viable. Looks like YouTube maybe the only place to see any kind of video footage from test 2. Edited by Massa_f1, 21 February 2019 - 17:40.